Some time ago, out of the blue, I decided to start a string of sentences with “Hey, Guess What…”. The intention was to gush over how much I love my boys, but it has grown into even more than that. It is a Kindness Game that we use for Building Self Esteem in Kids through positive affirmations, helping them experience the joy that comes with random acts of kindness while teaching them to also share positive words and kindness with others. This kindness game is best done for each kid individually, and it is most fun when done as a genuine random act of kindness. I don’t plan this ahead of time. I make it thoughtful. I do it equally for both of our children. I say it joyfully and meaningfully. 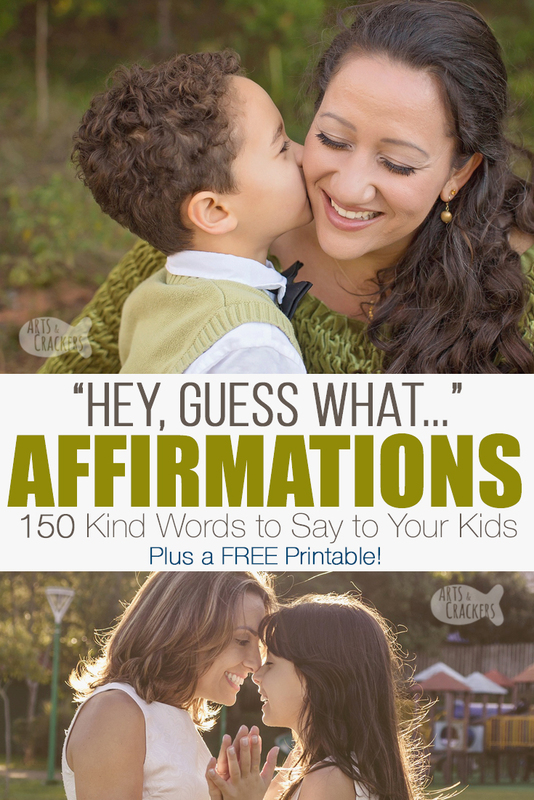 Get our FREE printable list of 150 Positive Affirmations to Say to Your Kids below! Sometimes I share a bit loudly, because I want them to know that I am not ashamed of these thoughts towards them and don’t care who hears, but generally I whisper it to them secretly—a special bonding time just between the two of us. Ultimately, the main goal is to let each child know that I truly love him and am proud of him and to affirm him in whom God made him to be. Unlike other affirmations, these are not meant to be said by the kids to themselves. These are kind words for us parents to say to our children so they know how much they are highly-revered and respected and loved in our eyes, which helps shape their inner voice! Fill your child’s love tank! Do you know your child’s love language? Check out “The 5 Love Languages of Children: The Secret to Loving Children Effectively”! 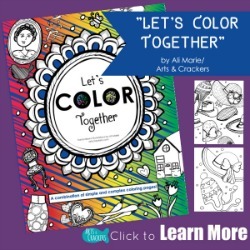 Color our “Be a Rainbow in Someone’s Cloud” coloring page! One thing I’ve grown to love about our “Hey, Guess What…” Kindness Game, besides building self esteem in kids and helping us stop to remember how blessed we are to have them, is that it will often inspire the kids to give affirmations back to you. As a mom who does not get out much, does not get many affirmations from others, and sometimes feels under-appreciated, this can really boost my confidence as a mother and helps us to know what our kids really think about us. This is never the goal, but it shows that your actions are inspiring positive reactions in them! Once in a while, my youngest will get a bit silly with his responses, but the more we work on kind affirmations, the more we set the example of what types of kind words make others feel special and loved. I don’t ever expect them to play the “Hey, Guess What…” Kindness Game back, but you know you are making a difference when they decide to all on their own. Children learn so much from the example set for them! Randomly, because we are all about random acts of kindness that are genuine and unexpected and unplanned, sit near or snuggle up to your child and whisper to them, “Hey, guess what…”. Wait for them to reply, “What?” This way you know they are listening. You may need to repeat yourself kindly a couple of times if you are struggling to get your child’s attention. If they are very busy with a task or intent on something, you may want to wait for a little bit so you do not interrupt them (I sometimes have to wait on my youngest to finish a puzzle or workbook page before I can make sure he hears what I’m about to say). Between each, I often pause for a little bit of time so it sinks in, and to allow them to say “thank you” if they want to. I do not require or expect this. This activity is ultimately meant to build the kids up more than it is to teach manners, so I do not focus on what I expect from them in return. 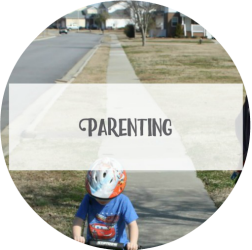 There is no set amount of times you should go back and forth for this kindness activity, but I usually keep it to ten at the most because of my son’s attention span and the fact that, eventually, he will want to interject and say some back to me. You can also give your child lunchbox note affirmations! We have some fun string cheese affirmation snacks, or you can purchase some! 2) I love you just the way you are! 3) I love you more than words can say! 4) I love you more than cake! 5) I love you, no matter what! 6) You make me feel loved! 7) Your love is refreshing! 8) You renew my spirit! 9) I’m so thankful for you! 10) I am so blessed by you! 11) You are such a blessing to others! 12) I’m so very glad that I’m your mom/dad! 15) Your smile brightens my day! 16) You make me smile! 17) Your smile is contagious! 18) You have such happy eyes! 19) You have such a kind heart! 20) You have a beautiful heart! 21) You have a servant’s heart! 22) You are a precious gift! 23) I love spending time with you! 24) I love your company! 25) I love hearing your voice! 26) When you sing, it makes my heart happy! 27) You tell the best stories! 28) I love listening to what you have to say! 29) I love when you tell me about your day! 30) You’re so good with words! 31) I love hearing your opinions! 32) You give me a fresh perspective! 33) You come up with great questions! 34) You’re a great thinker! 36) I love your curiosity! 37) You are a great problem-solver! 38) You are so talented/gifted! 39) I love your heart for learning! 40) You are marvelously unique! 41) You are wonderfully made! 42) God made you so special! 43) You are incredibly special! 45) You stand out; you’re outstanding! 46) You have a very special purpose! 47) My world is better with you in it! 48) You are so very important…to me, to God, to the world! 49) You make the world a better place! 50) You make a difference in the world! 51) You matter to me! 53) You can do great things! 54) You have so many great ideas! 55) I love your determination! 56) I’m glad you don’t give up! 57) You are a very hard worker! 58) I love your confidence! 59) You are so motivated! 61) You can do hard things! 62) I am so, so proud of you! 63) I love that you dream big! 64) I love that you try new things! 65) You are so smart! 66) You are so clever! 67) You are very crafty/creative! 68) You’re so good at… [climbing, building, drawing, running, etc]! 70) You give the best hugs! 72) You are so brave! 73) You are so strong! 74) You have such a positive attitude! 75) You are so caring! 76) You are the nicest kind of person! 77) You are so sweet! 78) You have very good manners! 79) You’re so thoughtful of others! 80) You have such a giving spirit! 81) You’re such a great big/little brother/sister! 82) You’re a fantastic helper! 83) You do amazing things! 87) You are very responsible! 88) You’re a natural leader! 89) You are so bold! 90) You are very supportive! 91) You are never alone! 92) You are so joyful! 93) You are so grown up! 94) You are so handsome/pretty/beautiful! 95) You are very patient! 96) I have so much fun when I’m with you! 97) You are so much fun to be around! 98) You take such good care of your pets! 99) You are an answer to prayer! 100) I pray for you all the time! 101) I love dancing with you! 102) I love holding your hand! 103) You and I make a great team! 104) You give me butterflies! 105) Your excitement gets me excited! 106) You make me laugh! 107) Your laugh makes me smile ear to ear! 108) You tell the best jokes! 109) I love your personality! 110) You are so flexible! 111) I love your energy! 112) You and I make the best memories! 114) You are a good listener! 115) You make life so wonderful and interesting! 116) When I think about you, it makes me smile! 117) You bring me so much joy! 118) You teach me grace! 119) I learn so much from you; you’re a great teacher! 120) You are such a great example to others! 121) I appreciate your honesty! 122) You have great self control! 123) You are great at practicing! 125) You are a rare gem! 127) I love how you stand up for what’s right! 128) I can always rely on you! 129) I wouldn’t trade you for anything! 130) If I could choose anyone to be my kid, I’d still choose you! 131) I’m here for you! 134) I believe in you! 139) I have faith in you! 141) You make my heart whole! 142) You make me want to be a better person! 143) You give the best high-fives! 144) You’re my rainbow on a cloudy, rainy day! 145) No challenge is too big for you! 146) I’d rather spend time with you than make a million dollars! 147) If life were an ice cream sundae, you’d be the cherry on top! 148) You’re one of my very favorite people! 149) I think you’re really cool! Have you ever painted and hidden kindness rocks? Does your child have separation anxiety? Come find out what helped us! This list of encouraging words and phrases will help you learn how to affirm your child. Don’t let this be a one-time thing! Show kindness to your spouse with this prayer template! Remember, you know your child best, so choose those that are fitting for your child. Keep all of it positive and truthful. If your child struggles with lying, for instance, but they sometimes tell the truth, don’t just tell them “I love your honesty.” Instead, you can say something like, “I love it when you’re honest with me.” (P.S., if this is an issue, you may want to check out our children’s devotional: Not Even a Little White Lie!) If your child has something they are extremely interested in (like mine are interested in puzzles and inventing), focus some on that to encourage their interests! If they’ve just accomplished a “big kid” task (using the bathroom like a big kid, tying their shoe, riding a bike), now is the perfect time to praise that accomplishment! You have the incredible opportunity to shape a young mind and build it with confidence, so go fill your child’s inner voice with kind, constructive words! Playing the “Hey, Guess What…” Kindness Game is a special way to bond with your kids. It helps you learn more about your child, focus on their great qualities, and your child may even share affirmations for you from their point of view! Print our list of positive affirmations here! 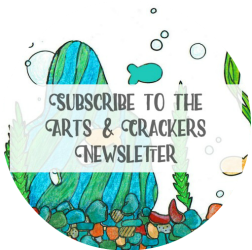 activity, affirmations, family, kids, kindness, list, love, parenting, printables, relationships, tips. Bookmark.